Five year-old Kaiya has been diagnosed with a rare and aggressive form of Leukemia. She needs a stem-cell transplant in around two months time to survive and she hasn't found one yet. The chances of her finding a donor would be higher if more Britons of Indian origin were on a register of stem cell donors. 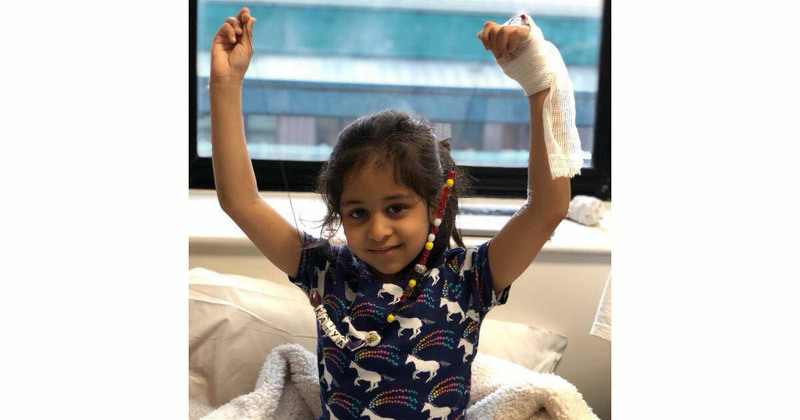 Her aunt Shetal Patel posted to Facebook: "I am appealing to your good nature to consider being tested to see if you might be a life saving match for her." "We welcome anyone to be tested but have been informed that those from an Indian origin would provide an even better chance of being a match. (Her parents and her sister were all tested but they were unfortunately not a match)." "Kaiya has had 5 weeks of chemo and is still fighting strong with good results. Please join her in this fight and help us save her life." According to the Anthony Nolan Trust, "9 out of 10 people donate their stem cells through the bloodstream in a straightforward process called peripheral blood stem cell (PBSC) collection. 1 in 10 donors will have their stem cells collected via the bone marrow itself, while under general anaesthetic." Not according to most people. "We’ve spoken to countless donors who only have positive things to say. Your G-CSF injections might cause you to experience flu-like symptoms and aching, but they're usually mild and will only last a couple of days," says the Anthony Nolan Trust. 1. Anthony Nolan Trust: If you are between 16 - 30 years old – register your details and they will send a swab kit to you in the post. 2. The NHS: If you are between 17 - 40 years old, the NHS register requires a simple blood test at any NHS Blood donor centre. But you must tell them you wish to join the British Bone Marrow Registry (BBMR) and is a quick way to know if you are a match. 3. Register via DKMS - If you are between 17 - 55 years old – you can request a swab test from that link. More British Asians need to be on the registered list, and anyone can develop Leukemia. So if you can, do help.